Raffles Hotel Le Royal Phnom Penh was built for luxury, and for years has been THE premier hotel in the Cambodian capital. The colonial design of the hotel – an artistic combination of Khmer, art deco and French influences – has instilled it with a sense of gracious elegance. 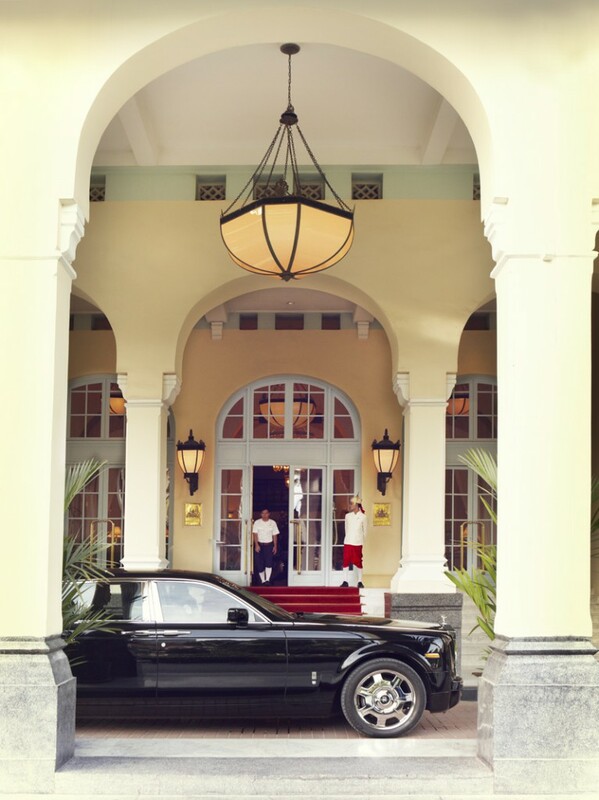 The hotel opened in 1929, and since then it has been the ‘go-to’ hotel for many famous guests. It was once the only place that the Cambodian Royal Family would invite their foreign dignitaries to stay at, including the former American First Lady Jacqueline Kennedy in 1967. 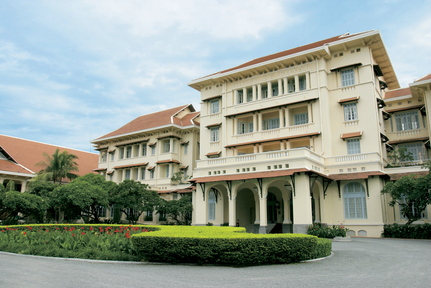 Raffles Hotel Le Royal Phnom Penh is located a short distance from the city centre, across the road from the American embassy. This landmark luxury hotel offers easy access to the Central Market and the local sights of Wat Phnom, the Royal Palace and the National Museum. Other must dos in Phnom Penh include the “Killing Fields” memorials, the Tuol Sleng Genocide Museum and the Choeung Ek Museum, both of which offer much insight into the genocide during the years of the Pol Pot regime. These are also easily accessible by tuk-tuk or taxi from the hotel. The hotel offers a variety of standard 5 star amenities. There is a pleasantly appointed swimming pool, a 24 hour concierge service, as well as the in-house Raffles spa which offers massages and therapies in the traditional Cambodian style. A highlight of the hotel is the Elephant Bar, a sensitively and beautifully refurbished space with stylish bars and silk shades. It was here that they famously created “The Femme Fatale Cocktail” for the former U.S First Lady Jacqueline Kennedy’s visit in 1967. Consisting of a heady mix of crème de fraise de bois, Cognac and sparkling wine, this is a drink which is still served at the bar to this day. There are many dining options at the Raffles Hotel Le Royal Phnom Penh, including the hotel’s fine dining restaurant, the Restaurant Le Royal, which provides a rich offering of both Cambodian and French cuisine. Overseeing the hotel’s dining outlets is Executive Chef Joel Wilkinson who has previously worked at London’s Grosvenor House Hotel on Park Lane and other notable destinations including Antigua’s Jumby Bay Resort and Song Saa Private Island. I ate twice at the Restaurant Le Royal. Our first meal was lunch, a very reasonably priced set menu of 2 Courses for USD$22 or 3 courses for USD$27. The lunch was delicious, beautifully presented and showed of superb technique. 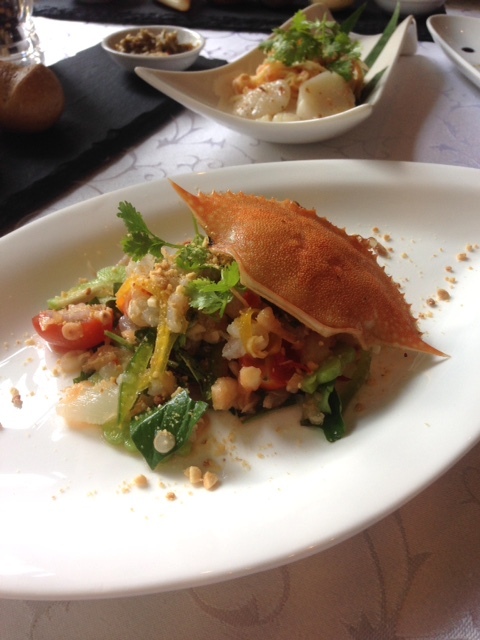 Here we tried a delicious flower crab salad with marinated raw crab in lime lemongrass and local spices. The crab was wonderfully fresh and particularly fragrant from the lemongrass and spices. Also from the starters, a green mango salad with seared scallops, roasted peanuts and nuoc mam sauce (fish sauce) was also delicious. 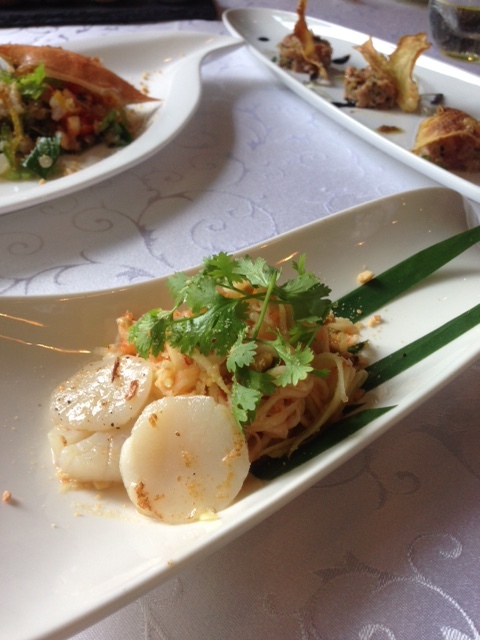 The scallops were nicely cooked, the peanuts provided crunchiness, and the green mango gave the dish vibrancy. What I enjoyed most about both these dishes was the use of both European techniques and wonderful local ingredients. Lobster amok cooked in banana leaf and infused with fish sauce and palm sugar was pleasant if a little underwhelming. Amok is the national dish of Cambodia (usually with fish). I really liked the wonderful richness of the sauce, but would have preferred chunkier, meatier lobster pieces. 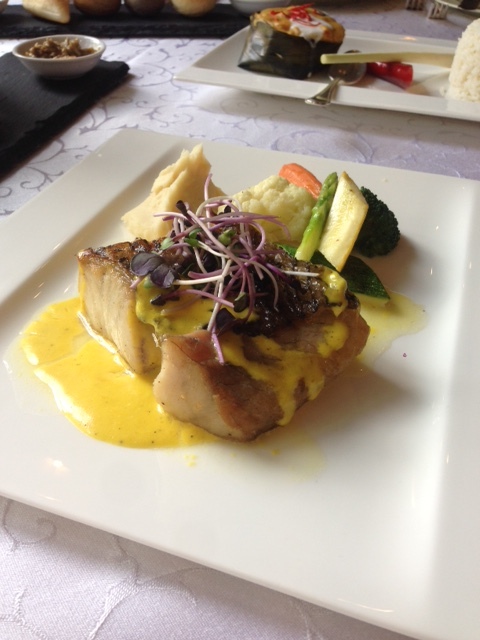 In contrast, the second main of pan-fried sea bass fillets with saffron sauce, mashed sweet and local vegetables was wonderful, with the sea bass being perfectly cooked and complemented nicely by the saffron sauce. Dinner was a five course tasting menu ($USD55) which kicked off with a delicious rendition of the Femme Fatale Cocktail as aperitif. Overall dinner was tasty if somewhat less impressive than lunch. A cream of poultry soup had a pleasant flavour but was a touch runny. 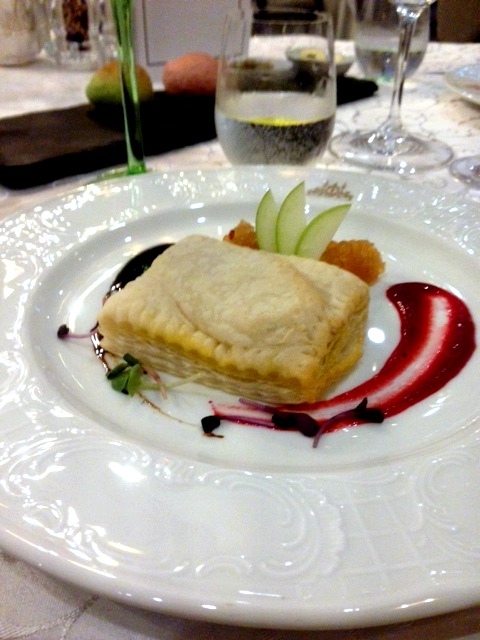 A second starter of pan-fried duck liver rissole encased in pastry boasted of delicious foie gras. However the pastry could have done with a touch more colour and been flakier. 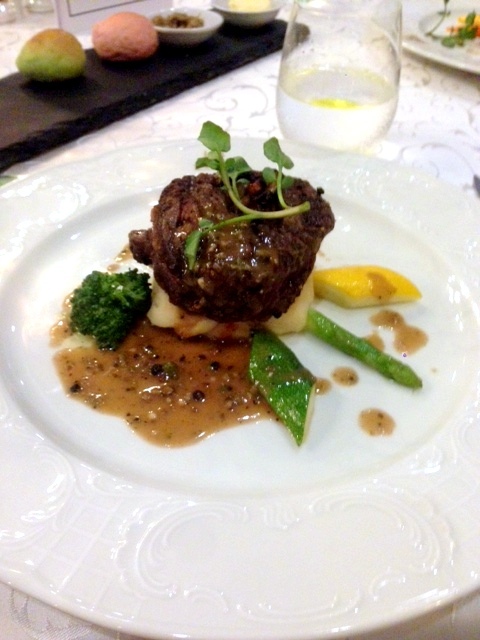 We also had a salad which was followed by a main of beef tenderloin medallion stuffed with wild mushrooms which was beautifully cooked. The steak was tender and succulent but was a bit too peppery. Finally, dessert was a respectable and tasty vanilla cream caramel. 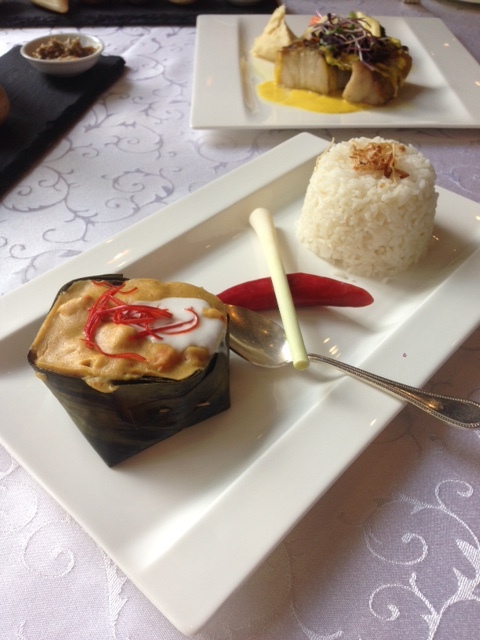 Overall I preferred the Cambodian inspired dishes at Raffles Hotel le Royal more. The final point to mention was the service at Raffles Hotel Le Royal Phnom Penh. Well this was every bit as good as what you would come to expect of the Raffles brand and something to truly enjoy as it was heartfelt local hospitality at its best. Note: I dined as a guest of the hotel but paid £USD170 for a one night stay. Prices: The set lunch menu was $USD22. The set dinner menu was $USD55. For room prices, refer to the hotel website.